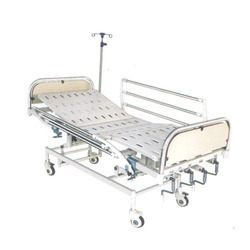 We are a leading Manufacturer of icu bed electric, icu bed mechanical and hospital fowler bed electric from Delhi, India. 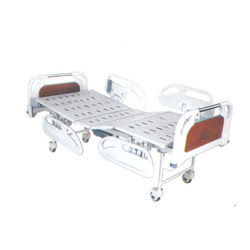 • Two Pieces individual detachable Side-rails, Stainless steel. • ABS Moulded Head and Foot Panel with locking and corner buffer. • Framework Made-up of M.S. Tubes. • 4 section top made-up of Oval perforated CRCA M.S. Sheet. • Bed Mounted on 5" Castors, 2 with brakes. • S.S. Telescopic I.V. Rod with 4 Hook and at 4 Location. • Finish: Pretreated & Epoxy PowderCoated. • Overall Approx. Size: 2090L x 910W x 625-820H MM. •Stainless steel Head & Foot Panel with laminated Board. 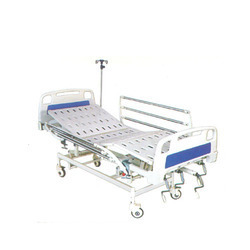 • Stainless steel two Pieces individual detachable side rails. • Framework Made of M.S Tubes. • S.S Telescopic I.V Road with 4 Hook at 4 Locations. • 4 Section top made of perforated CRCA M.S Sheet. • Obtained by smooth crank system with handle. • Overall Approx. Size 2090L x 910W x 625-820H MM. • Four Pieces individual Side-rails, ABS Moulded. • Heavy ABS Head and Foot Panel with locking and corner buffer. • Bed Mounted on 4" Castors, 2 with brakes. • Overall Approx. Size: 2090L x 910W x 600H MM.